THE POSSIBILITIES OF SPECIALTY-RX ARE ENDLESS! This option is perfect for someone who is looking for more customized programming with the flexibility of their own schedule. With a customized training program tailored to your specific fitness needs, your health coach will meet with you, discuss your goals, and help you reach those goals. This can be for fat loss, gaining muscle, moving faster, lifting heavier — whatever you may want! It is discussed between you and your personal trainer about how many days you need or what your programming needs to consist of. Your individualized health and wellness plan can consist of exclusive personal fitness training or a combination of physical training, nutrition counseling, and medical weight loss. 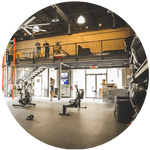 Are you a sport specific athlete or a member of a sport team and are looking for a facility and knowledgeable trainers to help with fitness and training? 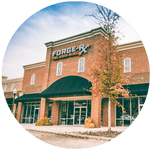 Look no further than Forge Rx. Our fitness trainers have experience working with teams and individual athletes to prevent injury and help make them stronger, faster and more powerful than ever before. 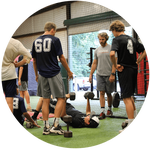 We take sports training seriously, these aren’t workouts just to tire athletes out – these workout programs will help them take their fitness abilities to the next level. We want to help you reach your goals! Contact us today by filling out the form or emailing us at Trainers@Forge-Rx.com for more questions about how we can get you the results you are looking for!